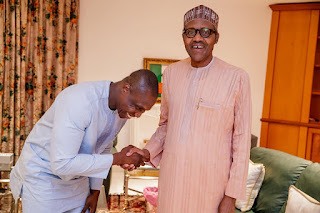 The National Coordinator of Buhari Youth Organisation, Olujanwo Obasanjo, has said no one can fault President Muhammadu Buhari’s integrity and honesty as a leader. The son of former President Olusegun Obasanjo said Buhari stood above his peers in the administration of the nation’s finances and resources. He, however, refused to compare the regime of his father with the incumbent, saying both operated under different situations. The young Obasanjo who spoke in Abuja while addressing journalists on why the president deserved a second term in office said youths had benefitted more from programmes and actions of this administration. He said, “Buhari believes in promoting Nigerian youths which is the basis of forming this association (BYO). This government has empowered the youths to go into farming and other entrepreneurship. Olujanwo said his support for Buhari had not in anyway affected his relationship with his father. The National Secretary of BYO, Dr. Garba Umar, said Buhari was well ahead of the presidential candidate of the Peoples Democratic Party, Alh. Atiku Abubakar. “Integrity and honesty is a major difference between Buhari and Atiku,” he said. Umar disagreed that there was massive job loss under this regime, saying this administration had attracted more youths to farming and engaged them more, citing the N- Power Scheme. He added, “With all these propaganda of job loss, there is no proper statistics to that . This government has done a lot for youths.